I've gone on record that the Jalapeño Popper, July's Kolache of the Month at Kolache Factory, is the best kolache since people started stuffing things in and on top of bread. It is a bold claim, and I know this. My pigs-in-the-blanket statement screams for a throwdown... a taste off... a tournament of kolaches! Will the short-lived menu item reign supreme or will perennial favorites "Sausage and Cheese" or "Potato Egg & Cheese" show why they are the pantheon of kolache flavors? 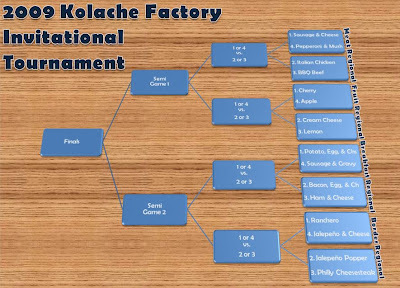 Sixteen kolaches will compete for the championship in the single elimination Kolache Factory Invitational Tournament (KFIT). 1. Sausage & Cheese – This is the #1 overall kolache in the tournament. The sausage and cheese is one of the top selling kolaches at KF. It also is the official kolache of the World Kolache Eating Championship, which is held in Houston, TX. Joey Chestnut, of Nathan's Hot Dog Eating Contest fame, became the current champion and world record holder when he downed 56 of these a few years ago (that's $43.76+tax worth of kolaches!). 1. Ranchero – This may seem like a controversial pick, but the Ranchero won its conference tournament and earned this #1 seed. Many kolaches have a hard time matching up Ranchero's killer combination of ham, eggs, cheese, and jalapeños. 1. Potato Egg & Cheese – Eggs and Cheese are a solid combination, and while the traditional pairing with a meat will win you games, the less orthodox potato is like running the spread offense instead of an I-formation. Stuffing a starch inside a starch is pirate-like genius, but will this lineup ultimately catch up with the P-E-C? 1. Cherry – The Cherry is deeply rooted in tradition within the fruit flavorings, so much so that the fruit itself is typically taken for granted. I've seen apple and lemon trees. I've picked a strawberry. I've been to the Atlanta area and drove hundreds of streets with slight variations of the words "Peach" and "Tree." I know not to lie if I cut one down, but I have never even seen a cherry tree. Yet I buy cherry flavored items weekly. Can the Cherry Kolache coast to a regional championship based on history and tradition alone? The regional brackets were filled out with a preference for region type, but some kolaches were seeded in regions not exactly suited to their type in order to balance their Kolache Rating Percentage Index (KRPI) numbers, which inevitably created some controversial matchups. A guy with feathered mullet hair and the sleeves cut off his shirt even commented, "Bring it tourney committee morons! Our cheesesteaks will beat a jalapeño cheese wit or witout!" Pepperoni & Mushroom commented on it's matchup with the #1 seeded Sausage & Cheese: "#1 will probably get knocked off someday... why can't it be today by us." When asked about its seeding in the tournament, Pepperoni & Mushroom added, "Look, we could easily have coasted to the final four as a fruit pizza, but the idea of competing with Lemons and Cherries is unsavory." The 2009 KFIT bracket is below. *The KFIT is in no way affiliated with the Kolache Factory, but at the minimum, they sold a crap load of kolaches to me in order for me to complete the tournament.